Mr Fabio Phiri, a Taxi driver from Lusaka, Zambia and his wife Priscilla Phiri, a maid at China Engineering and Construction limited welcomed a beautiful baby boy into their family six moths ago. 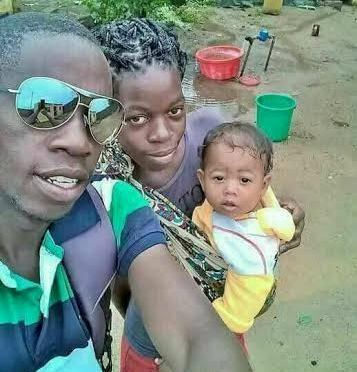 Despite the fact that the baby obviously looks mixed and that the woman may have been doing more than cleaning and cooking for her former boss, the young couple are very much happy and have thanked God for blessing them with a beautiful baby boy. "I love my son , he is a blessing to me , because of him I have been forced to even work hard in life so that I can always provide for him," Mr Phiri said. "He is a big boy now and is 6 months old , I named him after myself because he looks exactly like I do especially when I was a baby like him , his name is Fabio Ji Wu Phiri, the Ji Wu is a name we gave to him after my wife's former boss mr Ji Wu Young a Chinese engineer who was working at China Engineering and Construction limited , he helped us a lot when my wife was pregnant and has been very supportive to our family and the baby , even after he left Zambia , he still sends money to help us with up keep so the only way we could appreciate him is by giving some of his names to our son " Mr Fabio Phiri added. On her part, his wife Priscilla said she was grateful to God for giving her a beautiful and healthy baby boy. "I am very happy for this gift of a beautiful baby boy , I love him so much and I am thankful to God for giving him to me."